The Rio Olympics come to a close in just a couple of days, and today marks day 2 of competition in one of the oddest events to maintain its status in the Games: the modern pentathlon. Most of us are probably somewhat familiar with the decathlon and heptathlon, track and field competitions that combine a variety (a total of ten and seven, respectively...naturally) of events so that men and women can run, jump, and throw their way to being declared the world's best athletes. 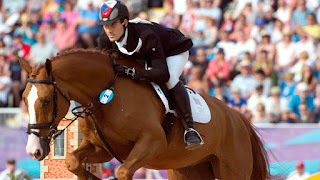 Compared to those, the modern pentathlon is kinda weird. It has running, swimming, fencing, shooting, and horseback riding (specifically jumping with an unfamiliar horse). When I first paid attention to the sport, I thought it looked like a reality competition for spies. Apparently, it really was created with the idea of including things that were important for a cavalry officer to be skilled at in the early part of last century. George S. Patton...later to be known simply by his surname...even competed in the first event in 1912! All characters start at level 1 and have 5 points to divide among the following skills: Running, Swimming, Riding, Shooting, and Swordsmanship. Whenever a task is attempted that has a chance of failure, a player rolls 1d20 and adds their character's level and rating in the relevant skill. If the total meets or exceeds a target number, the attempt is successful. Target numbers match the ranges used in some of the games you're already familiar with. A moderate task will have a difficulty of 10, a difficult task will be 15, and a very difficult task should be around 20. In combat, use armor/defense class as the target. When facing off in a sword-fight, characters can make opposed rolls, with the winner dealing damage to the loser. If in doubt, damage should be dealt 1d8 at a time. At the beginning of each adventure, players roll 1d12 for each level of their characters. This is the maximum HP of the character for that adventure. For each successful adventure, a character gains a level and can distribute 3 more points among the five skills. If a character ever attempts a task that doesn't have an associated skill, the GM can houserule that players may double their level bonus to the roll. But...this is the Modern Pentathlon RPG, so c'mon...work with me here. If the adventure isn't all about running, swimming, riding...and so on...you should probably play something else.